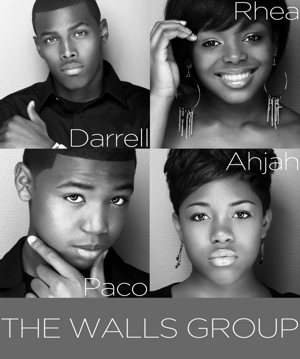 The Walls Group is made up of four out of eight siblings that have grown up singing the Good News of Jesus from as far back they can remember. Darrel, with his dynamic riffs and runs and those magic fingers, Rhea, with her sweet voice of velvet, Paco, with his raspy, soultry sound, and Ahjah with her powerful, jazzy style and beautiful smile, all come together to make the unique sound that so many have come to know and love. Coming from a musical family, where both their mother and father are musicians and singers, this 5th generation of singers bring a newer and exciting younger face to Gospel music. The Walls Group hopes to spread the message of Hope and Love through Jesus Christ and to Bless the hearts of God's People everywhere. Want to leave a message for The Walls Group? We'll post your comments right here!